I have been sent a batch of photo’s from Mustang Maniac which are of my car being loaded onto their transporter to be delivered to the paint shop where her new home will be for a number a while that could be around six weeks we are thinking at the moment. I am so excited that my car has got to this stage. The guys were on hand to make sure she was loaded onto the loader OK. As the yard was a little flooded due to the recent heavy rain fall, a plan to get her loaded during a dry spell was created. Cars had to be moved around in order for the shell to be moved from round the back. Like a parting of waves the synchronised moving and parking was all completed without a hitch. A celebratory cup of tea and a Jaffa Cake or three was in order after the well executed plan came together. What next till she’s back? Mechanics for engine, drive train, suspension and steering cleaning and polishing of all the bolt on bits and pieces, pretty much the same as before but on a smaller scale now. Well smaller scale compared to the chassis at least! The first of those will be the engine of course which has already been started this week. The engine has not been run for around a year now, and the guys mounted it onto their test rig, lightly attached the three-inch headers without the gaskets for now. The bell housing was bolted on, starter motor bolted on, fuel was piped in from a large jerry can standing to the side, a portable jump-start unit was connected then she was hot wired to start. The timing was well and truly out and the distributer needed a good twist to pull it back to the 6deg that is should be for idle instead of the fluctuating 30deg we currently had. We tried again then she barked into life. The engine was allowed to warm up and the oil pressure was checked, water temperatures were checked from the top and bottom hoses in and out of the radiator, the carb balance was initially set up and allowed to run after the timing was set. The engine was now running a little lumpy, the spark plugs were changed to the proper Motorcraft spec instead of the NGK I had previously installed. Fired her up and then she run without any misses at all. The engine was warmed up, rechecked and then given a bit of a progressive high-speed run up. 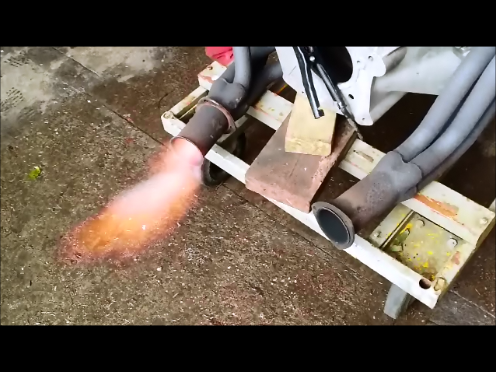 At this point I took a video which has been uploaded to YouTube here, or click on the quick link below for “Ford Mustang Flaming Exhausts”. There were flames from the exhaust which was quite good fun, and no this is not a Photoshopped photo. Turn up the volume and enjoy the sights and sounds from a v8 289cid engine ran in anger! After the engine was run for a few minutes it was allowed to cool down and taken of the test rig to be mounted onto the engine stand. In my excitement I forgot to take pictures of the engine on the stand, but I will rectify that next week don’t worry. We took all the bits of the engine such as the headers, carb, HT leads, coil, the full distributer removed from the block, starter, water thermostat housing, fuel pump, power steering pump, vacuum lines, crank pullies etc. 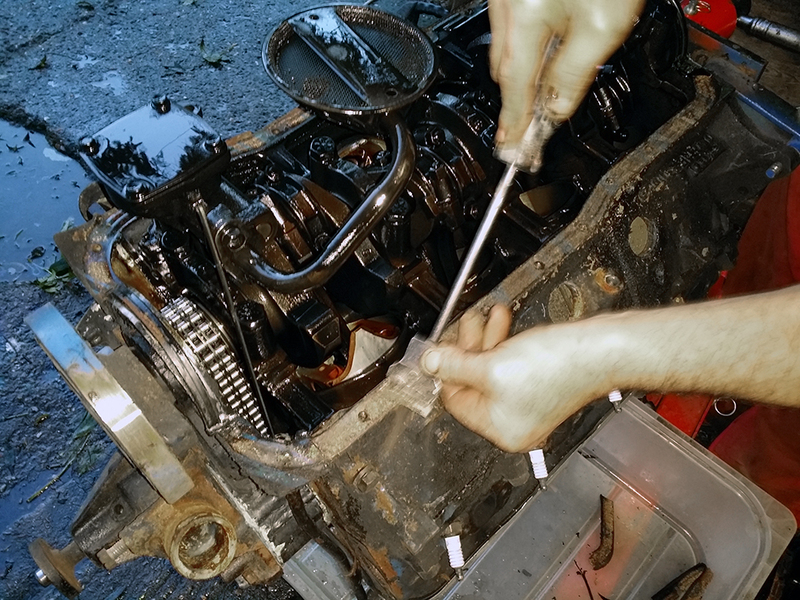 The engine was now just the heads and block, we drained the oil and as much water as we could. We turned the engine upside down and the damaged oil pan we knew about was unbolted. This is a very common damage to the oil pan which is due to the car being jacket up via the oil sump pan. If you look you can see the circular pattern of the trolley jack. The next job was to remove the core plugs to see how the water has been flowing around the block and if the water ways are furred up or not. We suspected that they were fine as the engine was not running hot from the previous tests. Terry used the video scope to check deep inside the block and all looks to be OK so far. I have taken some pics through the core plugs to show the gaps are still open between the cylinder jackets and in very good condition, I even managed to get a shot of a valve through a manifold bore. The oil pick up gauze was clean and no bits of metal were wedged in there. We checked the oil for any debris and again was fine apart from being very weak. We then checked the timing chain for play which was fine. the engine was cranked over by hand to watch the motion of the pistons were as they should be. Terry then cleaned up the gasket from the oil pan and decided that now was a good time to put everything in containers that should be there. It was getting dark and we didn’t want to lose any bits. Terry put up with a barrage of questions from me and answered all of them and even showed me where I looked a little blank when we got seriously into the engineering! Thank you Terry for the tutorials. This entry was posted in Car, Photo's and tagged body shop, cleaning, distributer, drive shaft oil seal, flames from exhaust, ford, headers, mechanics, Motorcraft, Mustang, Mustang Maniac, oil pan, oil pump, One man and his Mustang, paint shop, polishing, spark plugs, timing chain, v8 289, valve, YouTube. Bookmark the permalink. A symphony of cylinders indeed. Love that sound! This is starting to get really exciting. What a great job you all are doing. Thanks Timothy. Lots of little clean up projects goin on behind the scenes as well. I shall put a few pics of them up too soon. These guys have a pretty special bunch of skills between them, and It’s great to be mentored by such a high quality crew. Great to see you back!!! can’t wait to see her when she’s back from paint!! Thank you very much. I will posting some pictures as soon as she is back don’t worry.